S. SMITH & SON HUNTING CASED QUARTER REPEATER CHRONOGRAPH GOLD S. Smith & Son, 9 Strand, London W. G. 154-166. Made circa 1910. 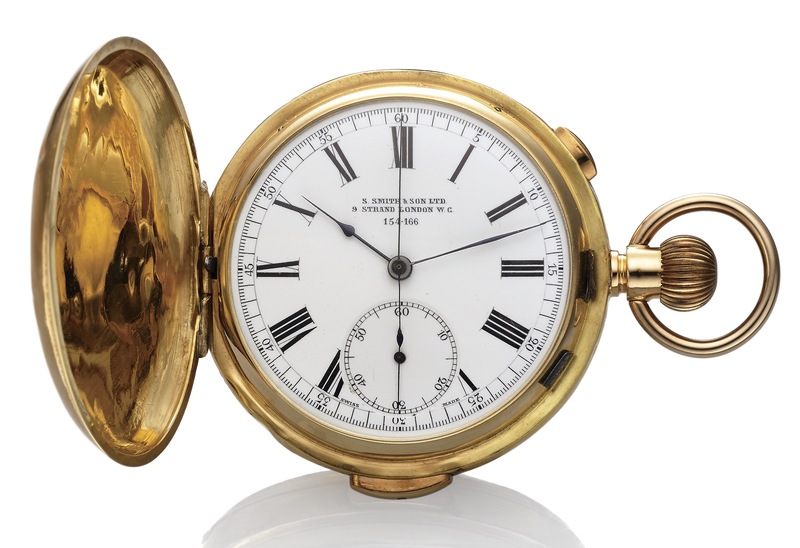 Fine and rare, quarter-repeating, yellow gold hunting cased keyless pocket watch with chronograph. Four-body, polished, chronograph operating button at 2. Hinged gold cuvette. White enamel with radial Breguet numerals, outer 1/5th seconds track with 5-second Arabic markers, subsidiary seconds dial. Blued steel spade hands. 42 mm. nickel-plated, 18 jewels, straight-line lever escapement, cut bimetallic compensation balance, Breguet balance spring, index regulator. Repeating on gongs activated by push-button on the band at 6. C. Four-body, polished, chronograph operating button at 2. Hinged gold cuvette. D. White enamel with radial Breguet numerals, outer 1/5th seconds track with 5-second Arabic markers, subsidiary seconds dial. Blued steel spade hands. M. 42 mm. nickel-plated, 18 jewels, straight-line lever escapement, cut bimetallic compensation balance, Breguet balance spring, index regulator. Repeating on gongs activated by push-button on the band at 6.